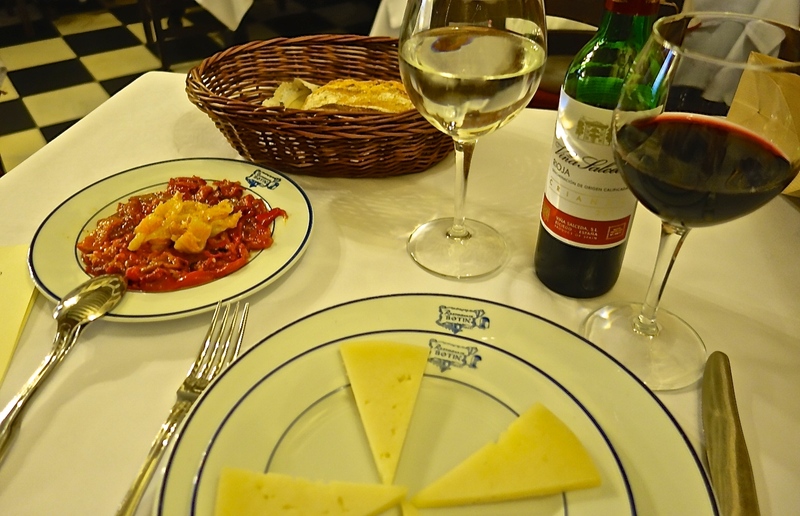 On Calle de los Cuchilleros, near Madrid’s Plaza Mayor, sits Restaurante Botin. Opened in 1725, it purports to be the be the world’s oldest continuously operating restaurant, and even has a couple of prominently displayed Guiness World Record certificates to prove it. Because of this distinction, as well as the fact that they serve some of the best roast suckling pig in this part of Spain, the place is consistently packed with tourists and locals alike. 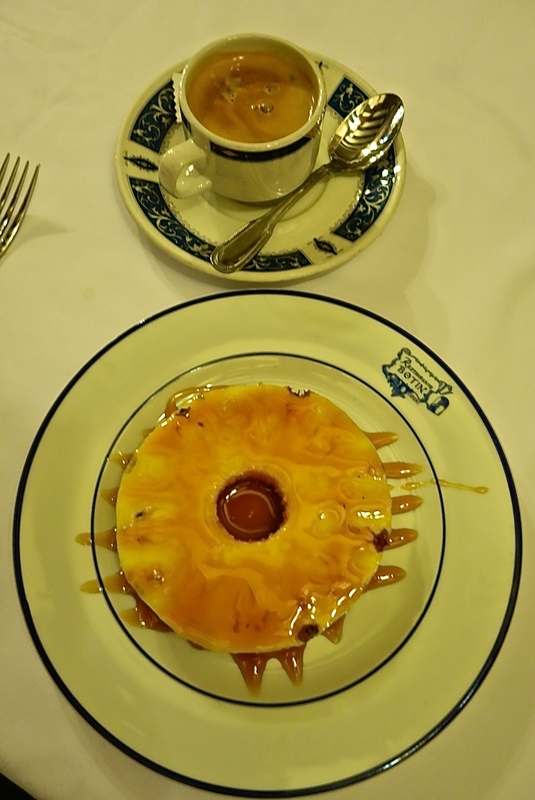 If you’re going to experience the world’s oldest restaurant, do it right. 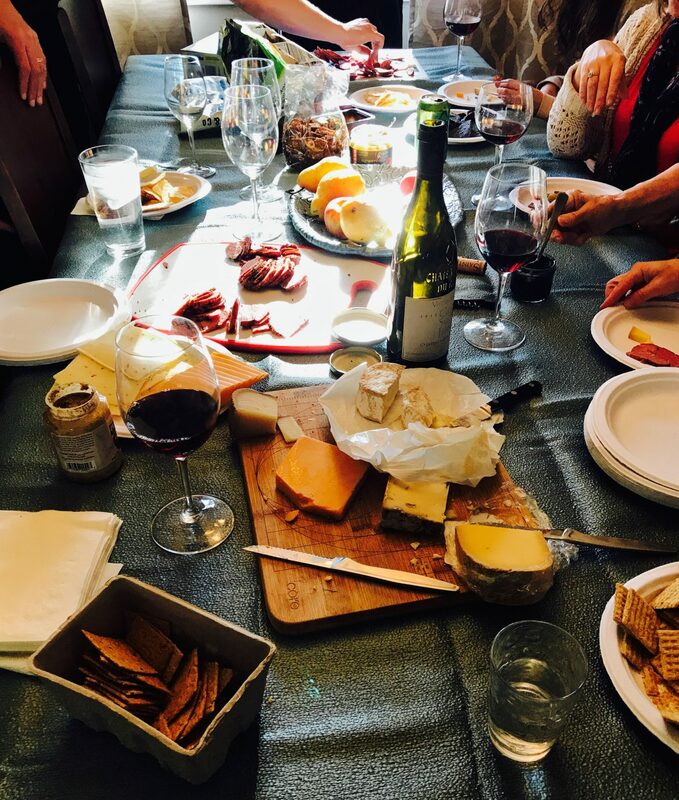 Arrange a tour, one where you get to explore all the nooks and crannies of the place before it opens for the day–and, of course, one that includes a sampling of multiple courses from Botin’s menu. 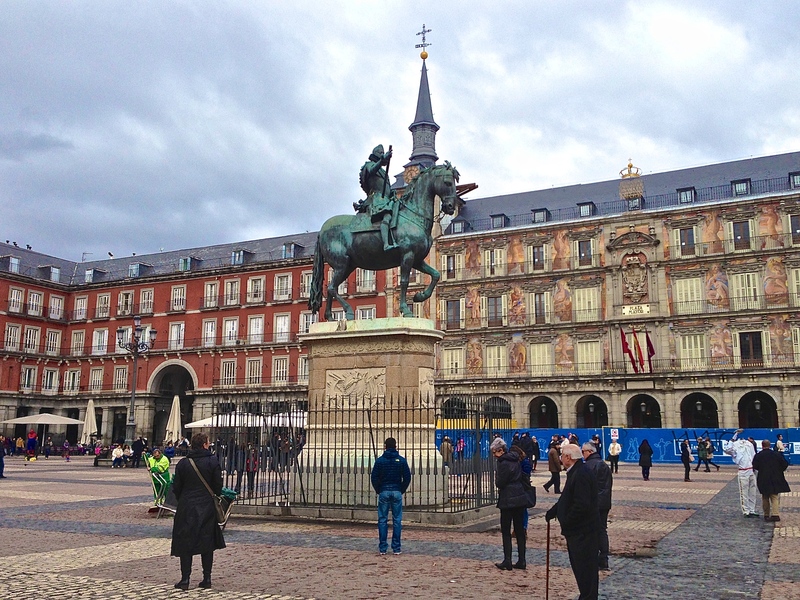 There was time to stroll the souvenir shops that line the square at Plaza Mayor and browse the stalls of the colorful Mercado de San Miguel, which primed me all the more for a good Spanish meal. I headed back to Botin, where I was greeted by Phil from Insider’s Madrid, a very knowledgeable tour group that provides all manner of tours throughout Madrid and to points of interest nearby. They were good enough to squeeze me in on short notice, arranging for what turned out to be a private tour of Botin. We entered the building as the restaurant staff, dressed in every imaginable combination of crisp white jackets, beanies and chef toques, was zipping from room to room, popping unexpectedly from unnoticed doorways, in preparation for lunch service, which begins at 1:30 p.m., a commonly accepted starting point for lunchtime in Spain. Part of the pleasure of eating at Botin is the building itself. The restaurant has four levels, each with its own decor, personality and history, all connected by a series of narrow winding staircases. As Phil showed me around, he explained that Botin has only changed hands once in the entire history of the restaurant. 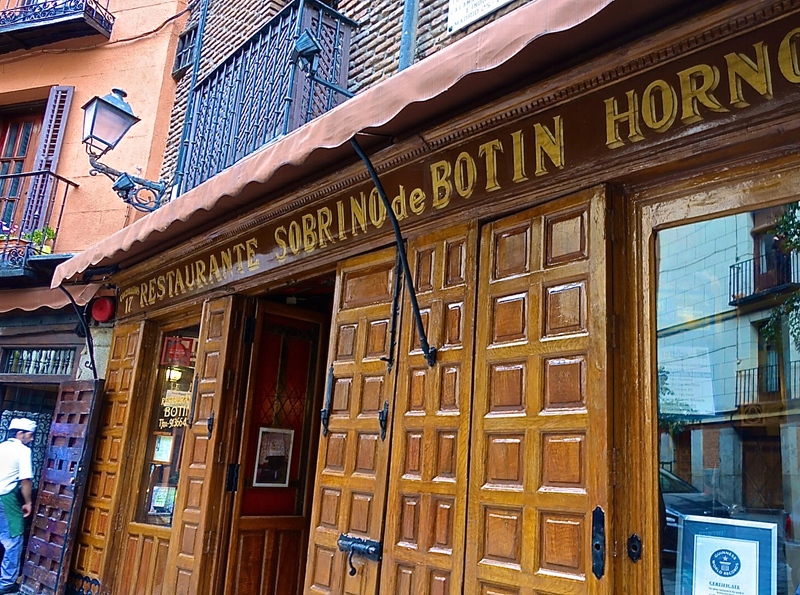 It was started by Frenchman Jean Botin, who passed it to his nephew, thus the name on the restaurant’s exterior, Sobrino de Botin (nephew of Botin). 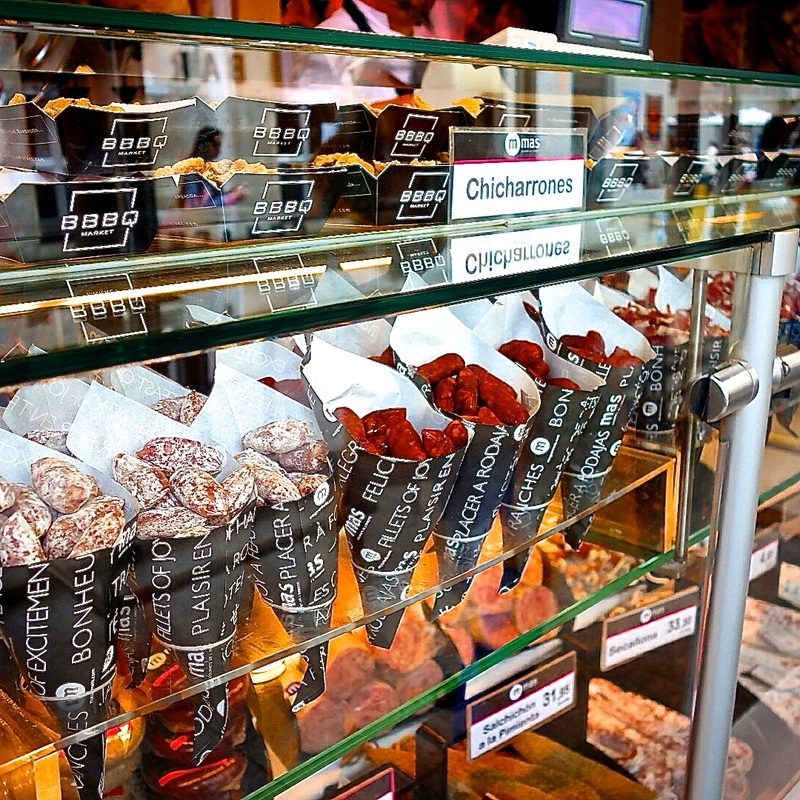 Then, in the early part of last century, Botin was passed to the Gonzales family, which has run it ever since. 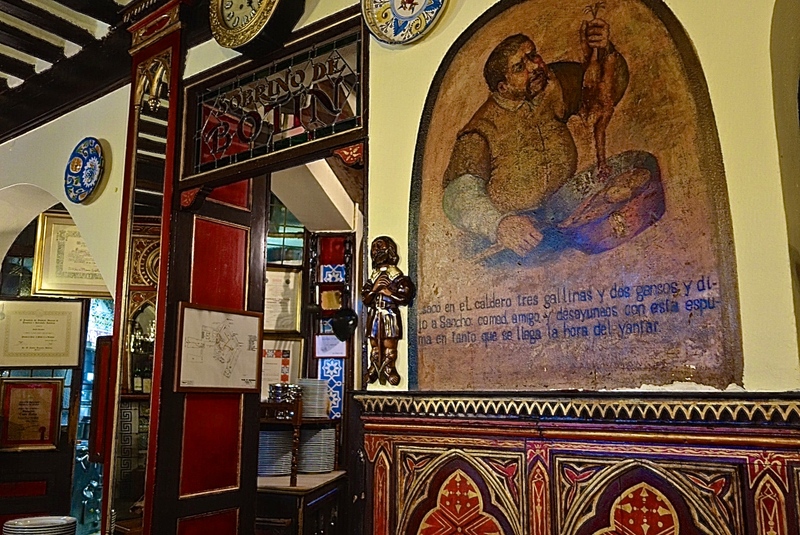 The restaurant has endured through many earth-shattering events, including the invasion by Napoleon and the Spanish Civil War, sometimes trading meals in return for the restaurant’s very survival. Over the centuries, a who’s who of royalty, politicians and celebrities has entered the doors at Botin. The painter Francisco Goya is rumored to have been a dishwasher here in the 1760’s while he attempting to gain acceptance to Spain’s Royal Academy of Fine Arts. (The nearby Museo del Prado holds an extensive collection of his work.) And an impressive number of authors have referred fondly to Botin in their writings, including Benito Perez Galdos, Ramon Gomez de la Serna, Graham Greene, James Michener and Frederick Forsyth. Ernest Hemingway loved this place. It seems to have been one of his primary hangouts while living in Madrid off and on for several decades. Phil said that “Don Ernesto,” as he was called by the Spanish, would often duck behind the bar to make a batch of martinis. He even attempted to whip up a paella in the kitchen one night, though apparently this did not go over very well. The ground floor at Botin offers a look at the restaurant’s memorabilia, a small amount of seating, and, best of all, a peak at some of the inner workings of the kitchen. 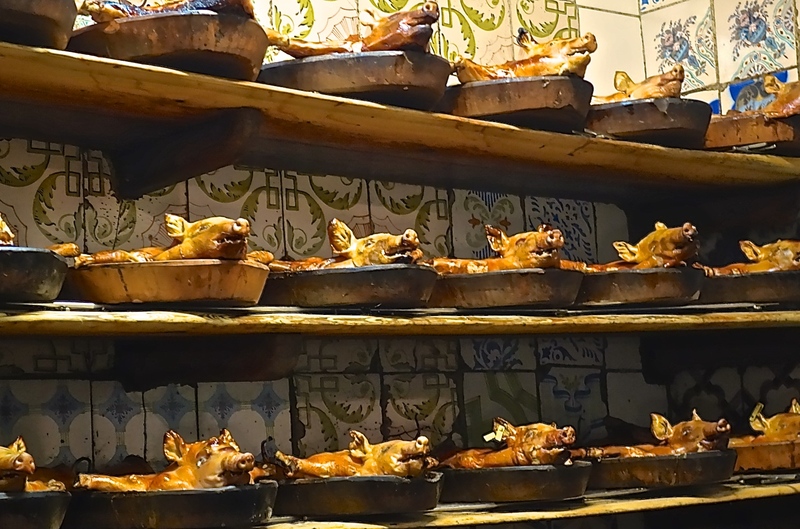 The dish for which Botin is known far and wide is its traditional roast suckling pig, or cochinillo asado. Phil showed me the original cast iron oven, still in use today. 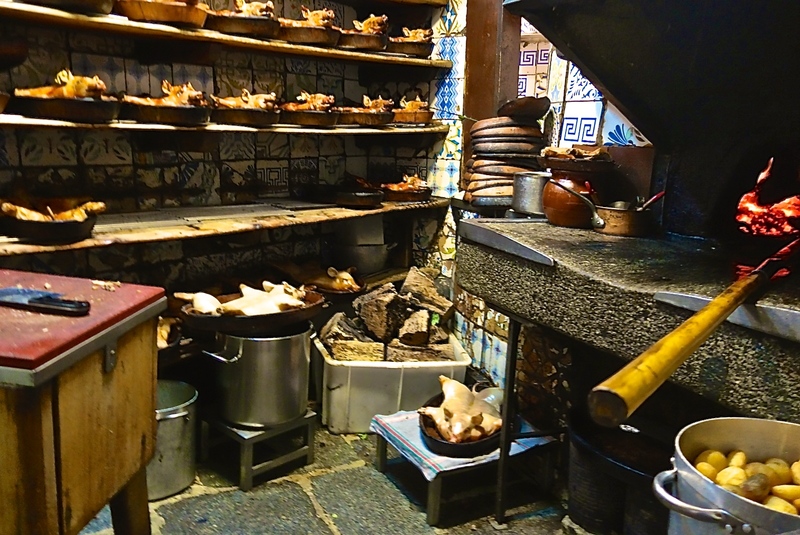 The tiny cooking area is surreal: imagine the kitchen processes of a wood-fired oven pizzeria, but instead of pans of dough, there are sprawling piglets lined up and ready to go into el horno. 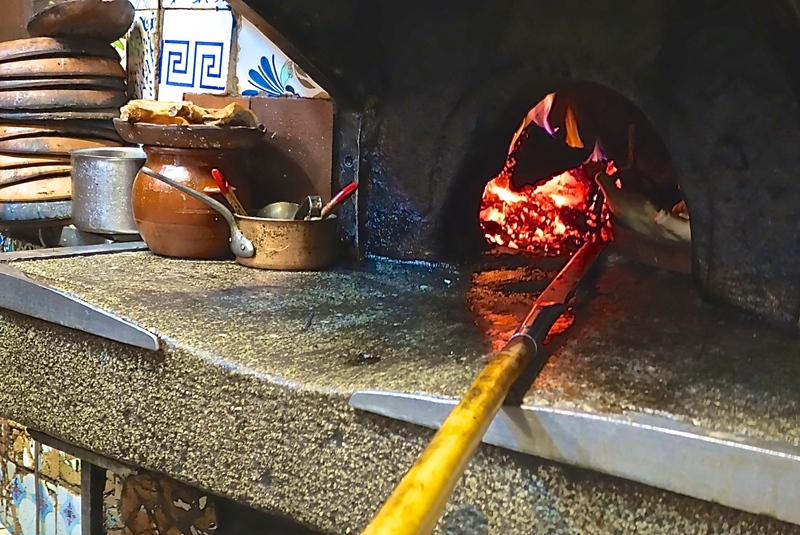 Using what looks a bit like an extra long wood and aluminum pizza peel, one by one, each clay dish is slid into the oven to cook via the indirect heat of the fire. The sight of all these roasted piglets was too amazing for me to take in alone, so I immediately sent a photo to my husband back in Houston. “Creepy, yet so tasty-looking,” I texted. “If you say so, ” he replied. The warm, convivial second floor dining room at Botin seems to be the hot spot of the restaurant, where most of the Spanish-speaking patrons congregate. The third floor is quieter, with walls of cool blue and white tiles, dimly lit the day I was there by the late morning sun. This room has a more spacious feel because of its higher ceilings, and is often reserved for private meals and events. The cellar is an arched room of lovely old brick, a warm and inviting place to dine. And yet that was not the last level in Botin. I almost laughed when Phil pointed toward one end of the cellar where there was a small dark opening and a little iron gate. Really? We took a few tenuous steps down into yet another room–more of a narrow hallway, actually–through an entrance small enough that I clunked my head on the bricks of its almost hobbit-sized archway. This space was used as the wine cellar until it flooded a few decades ago. However, its main purpose long ago may have been as part of a network of tunnels used by the upperclasses and Church officials to quickly move about the city and thereby avoid the masses of commoners in the street. The ruined wine, caked with dust, was still sitting in the racks, and the space had a dank, moldy smell. So perfectly haunted-feeling that you could swear the whole thing was a set piece from a Disney attraction. For good measure, I clunked my head once again as we climbed the steps and reentered the cellar dining area. By now it was 1:30, and guests were piling through the doors. It was well-oiled chaos: waiters and staff weaving through the crowd, along the narrow hallways and winding stairways, almost like a dance you could tell they’d performed a million times before. big meal and drank three bottles of rioja alta. The small table is in a back corner, away from the main traffic flow of the room, allowing a diner to unobtrusively observe others and listen to the conversations of surrounding tables. As I sat there imagining what Don Ernesto might have ordered, the waiter brought out a platter of pimientos asados con bacalao, roasted red peppers with strips of raw salt cod. The bright peppers and mild fish are a meal in themselves when paired with sliced Manchego, a glass of Ribera del Duero vino tinto and a basket of crusty bread loaves. Next came two small plates. 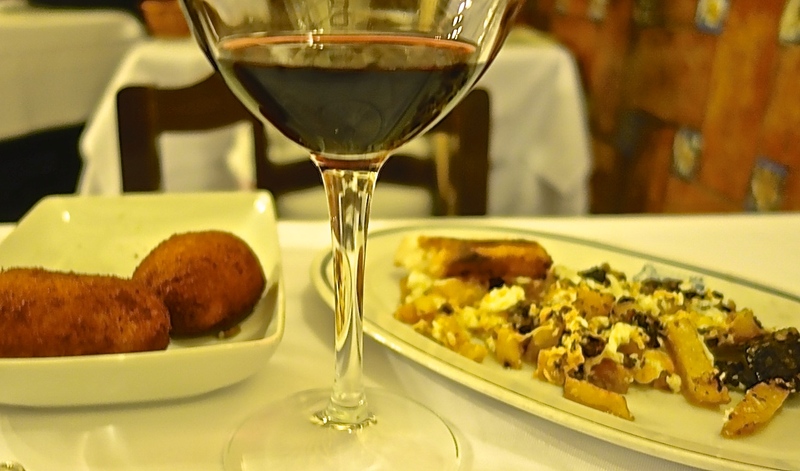 The croquetas de pollo y jamon, ham and chicken croquettes, are a traditional tapas dish found throughout Spain. They are creamy on the inside, usually made using béchamel and sometimes mashed potatoes. The Revuelta de Casa (morcilla y patatas), is a delicious jumble of scrambled eggs, small chunks of blood sausage and fried potatoes. With these two dishes I held back a bit in order to leave room for the star of the meal, the cochinillo asado. The impeccably roasted pork reminded me of the cochon de lait I had savored as a kid in South Louisiana: the marvelously crackly, salty skin that gives way to a soft layer of fat beneath, melted from the high heat into nothing but juicy flavor–so good that the tender pork beneath them is almost superfluous. 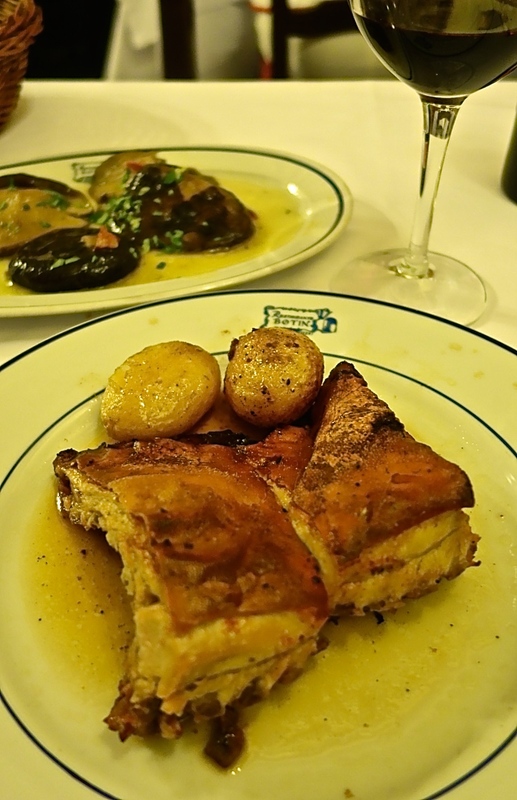 Alongside the pork was a plate of large, flavorful Segovian mushrooms sautéed in olive oil. The suckling pig was served with a couple of roasted baby-sized potatoes. The Spanish love las patatas, and it’s so easy to love what they do with them. The types of potatoes in Spain are distinct from those we can easily find in the U.S. 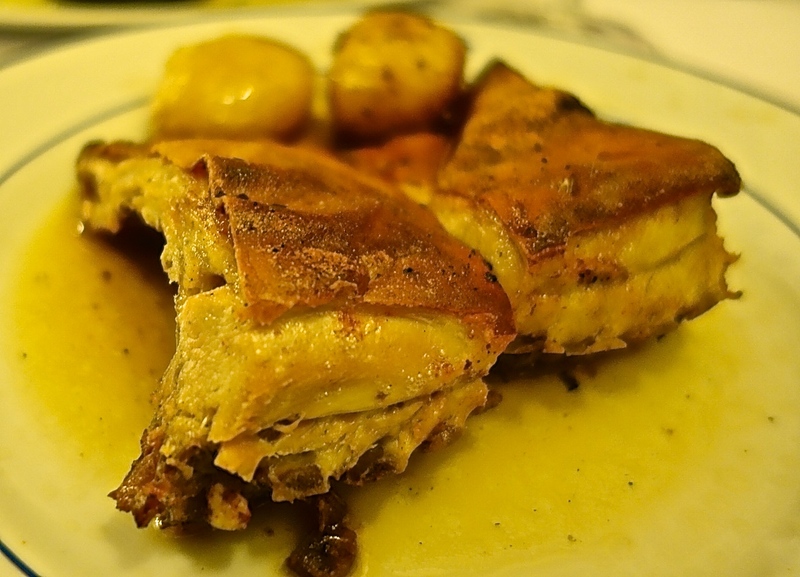 The ones at Botin had the texture of the Yukon Gold variety, with a thin, tender skin that had soaked up the juices from the pork. If the walls could talk at Restaurante Botin they would share so much history, so many secrets, so much interesting conversation and so much good cheer that it could fill several volumes. Here’s hoping this place will be around for a few more centuries to inspire the pens of a few more great authors and provide pleasure to all the rest of us.